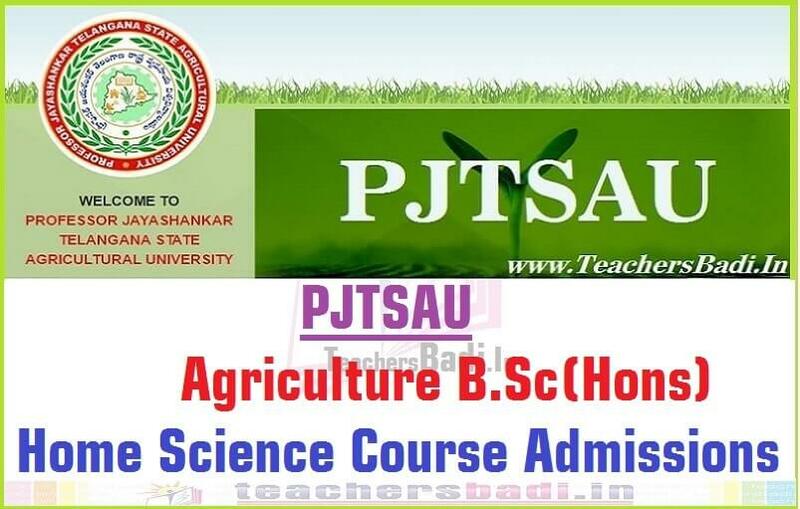 PJTSAU Agriculture B.Sc(Hons) Community/Home Science Course Admissions 2018, Agriculture Degree admissions without EAMCET, online application form, last date for apply, list of documents for certificates verification, selection process, registration fee and how to apply details given here. Professor Jayashankar Telangana State Agricultural University(PJTSAU), Administrative Office has given the Agriculture B.Sc(Hons) Community/Home Science Course Admission notification on 05-06-2018 and applications will be invited for admissions into the following degree courses of Professor Jayashankar Telangana State Agricultural University(PJTSAU), Telangana State for the academic year 2018-19. The candidates for admission to the B.Sc.(Hons.) Home/Community Science course shall be required to have completed 17 years of age on 31st December of the year of admission with an upper age limit of 22 years for all the candidates, 25 years in respect of SC and ST candidates and 27 years for Physically Challenged candidates. The candidates shall be selected based on merit in optional subjects of the two year Intermediate or its equivalent Examination as per the rule of reservation. In case of other equivalent examinations passed by the candidates, the weightage of marks obtained in optional subjects shall be reckoned on par with those of the two year Intermediate examination. In case of a tie in aggregate marks in optional subjects obtained by two or more candidates, the marks secured in the Intermediate (10+2) shall be taken into consideration. In case of a further tie, the age of the candidates shall be taken into consideration and the older candidates shall be given preference for the seat. Payment of application fee: For applicants belonging to OC and BC social status, the amount is Rs. 1,200/- (Application Fee) + Rs. 50 /- (Online Processing Fee) and for applicants belonging to SC, ST social status and PH, the fee is Rs. 600/- (Application Fee) + Rs. 50 /- (Online Processing Fee). The applicant has to select Debit Card /Credit Card (Visa / Master Card)/NET banking/ Wallet option to pay the application fee and follow the online instruction to complete the payment of fee. -- The applicant should read the prospectus and instructions very carefully before proceeding to apply online. -- The applicant should keep scanned copies of all documents ready before proceeding to apply online. a. Bonafide / Study Certificates in original related to Class VI to XII. b. Marks Sheet/ Grade reports in original related to Class VI to XII or 3year diploma in Community/Home Science. c. Transfer Certificate/ School Leaving Certificate, Bonafide/Conduct Certificate from the School last studied. Government Hospital with description of the kind and the degree of disability. f. The relevant certificates, in case of candidates seeking admission under CAP/NCC/Games & Sports quota. g. In case, the Date of Birth is not mentioned in Class X Certificate, Date of Birth (DOB) Certificate. h. Residence Certificate, if necessary. j. Three recent and clear passport size colour photographs with name as uploaded on the application form. k. Two conduct certificates one from the College or School where the candidate last studied and the other from an Gazetted officer of the State Government or any other respectable person. Tahsildar of the Revenue Department of the Mandal concerned. 1. The guidelines of the Government of Telangana from time to time shall be followed. 2. Fees once paid to the University shall not be refunded under any circumstances. In addition, the candidate has to pay the cancellation fee, if the candidate leaves the institution. Guardian of the candidate will be allowed for counselling. 4. The candidate who secures a seat, should submit the certificates in Original along with the prescribed fees at the time of counselling. 5. The University does not guarantee any employment to the candidates. 6. Candidates are required to read the PROSPECTUS thoroughly. For any other information, that is not mentioned in the PROSPECTUS, the candidates may contact the Help Desk No. 9100321295 between 10:30 am to 4:00 pm on all working days. Science for the academic year 2018-19: The below mentioned third batch of candidates have been provisionally selected for admission into B.Sc.(Hons.) Community Science for the academic year 2018-18. They are informed to report to the Associate Dean, College of Home Science, Saifabad, Hyderabad on or before 24-07-2018 by 4:00 PM along with all their original certificates and required fee Rs. 26,770 /-. In case, a candidate fails to report by the stipulated date and time her admission shall stand cancelled.